Works of art often go on a journey before they arrive before your eyes. It's a transformational process that carries the artist along with the work. Artists will sometimes share the process by which they shape their work, as well as their own inner journey. Mixed-media artist Dave Borba's unveiling of a new artwork—in addition to his detailed documentation of the process that allowed it to take flight—are intended to be equally illuminating. The 35-year-old Salt Lake City native didn’t start creating his mixed-media sculptures until several years ago, when he made a hand-painted devil ventriloquist doll, with a lever that made the mouth move, as a Christmas present for a friend. From there, he was off to making similar items—some based on the theme of devils, some including hearts or other themes at their center. He first displayed his works at the 2008 Utah Arts Festival and has shown in other galleries locally. He was at the UAF this year, repeating from 2010 as a returning award winner. His works, constructed of wood, metal and other materials, are often whimsical, yet symbolic. “The Butterfly Feeling,” for example, is a human heart with butterfly wings. “It’s about falling in love, that spark on the inside,” he explains. Borba has worked as a finish carpenter, in commercial and freelance photography, graphic design, illustration and fine art and most recently helped a local industrial lighting company get off the ground. With no formal education in the arts, Borba has been “winging it,” learning from mentors like local metal artist Adrian Prazen. As with most of his pieces, the bird itself is interactive. You can turn a crank on its base, which in turn rotates a flux shaft, which transfers energy to the ornithopter. The bird, its wing bandaged, pedals a mechanical device to make artificial wings flap. Borba says it’s dedicated to the human spirit’s enduring hope, perseverance, determination and ingenuity. “Even though the bird is wounded, he’s figured out a way to carry on with his journey,” he notes. In addition to the emotional resonance of the work, there’s something scientific about the piece and his method. All of his sketches and 138 photographs of the work in progress will give an intricate view of his methodical, meticulous process in constructing the piece, which took about six months to bring to completion. His pieces are all completely handmade, including carving, mold-making, assembling and painting. For this piece, he even made his own screws. There’s something reminiscent of Leonardo da Vinci’s sketches of flying machines here, as well as a nod to the folk-art tradition. While working on the bird, it became more and more apparent to him that it was a self-portrait, but his perspective on this side of the process has also been transformed. “The original theme of using an artificial means [of flight] is less appealing to me now than the concept of dealing with our wounds and tending to them, and not escaping them,” Borba says. Healing takes time, and perhaps with the distance emotionally from where he was when he began the piece, things look different. 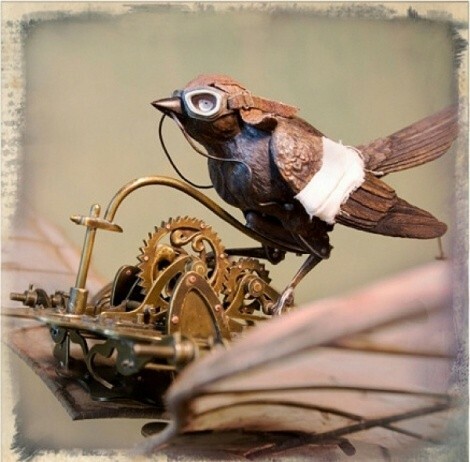 But the injured bird on his flying machine is still a brilliant metaphor for the “work-around,” how to keep moving forward in the immediacy of encountering difficulties and could also serve as a symbol for the artistic process itself. Friday, Aug. 19, 6-9 p.m.